Each time I have a bottle of anything from the Samuel Smith brewery, I really look forward to it now. Every one I have had has been a winner, and I expect nothing different from this one. There is some great cascading head action in the pour. It ends up tall, creamy, and slightly amber in colour. There are lots of bubbles popping in it, leaving it looking like a slow-falling cake and eventually just a skim of bubbles & lacing on the glass. Th colour is a lovely slightly hazy amber. This ale has Smith's characteristic smell... I would swear the water's going to be a star again here. The beer smells a bit more like a hoppy pale ale than I expected it to (some subtle fruity esters), but, overall, I find this beer smells just like them... like a British ale... subdued smells of grain / toffee, earthy hops, and that mineral-y water. The flavour's great... mellow malt notes like toffee, followed with a slight acidic tang - fruit notes like orange alongside honey and wheat. The aftertaste is mellow, a bit earthy, and yet a bit bright and fruity. At times, it almost reminds me of a light bread pudding. The feel is medium & smooth, and the carbonation a subtle blanket of minute tingles. The finish is mostly dry, and a bit sticky. Overall - love it... such a great British ale. It's fairly light and very drinkable, but has lots of subtle character that doesn't beat you over the head. This is a well-balanced, quality brew in every aspect. 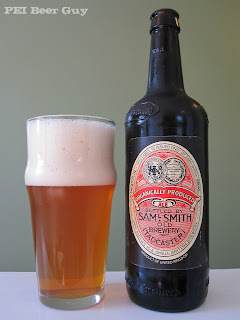 Samuel Smith is fast becoming one of my favourite breweries.